Hello Everyone! Thank you so much for all the sweet comments on my win at Whisper Wood Cottage. The weather has been so crummy here in Virginia that it has kept me inside to work on some long over-due projects. 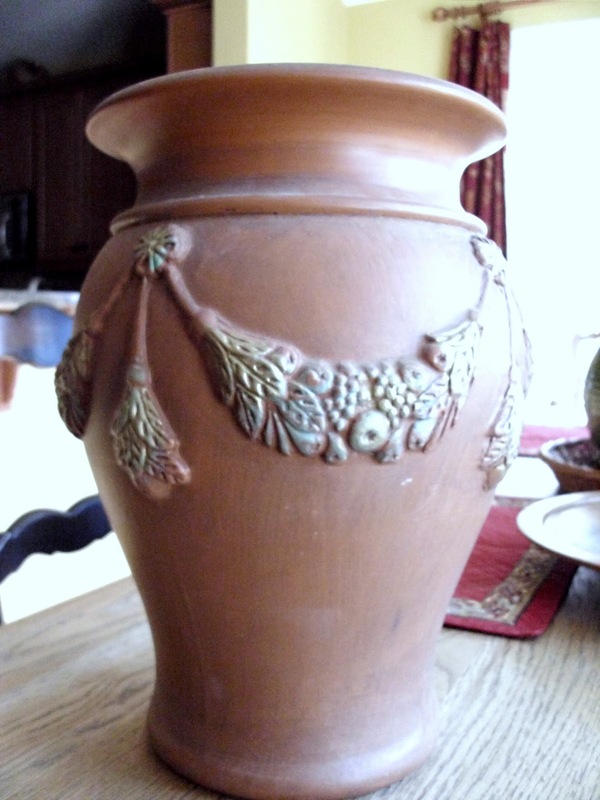 I bought two Anduze style terracotta pots at a garage sale last year for fifty cents each! The original pots were made in the village of Anduze in France’s Gard region. They are round pots and decorated with a swag of garland. Orange and lemon trees are normally planted in these pots so they can be moved inside in the case of frost. 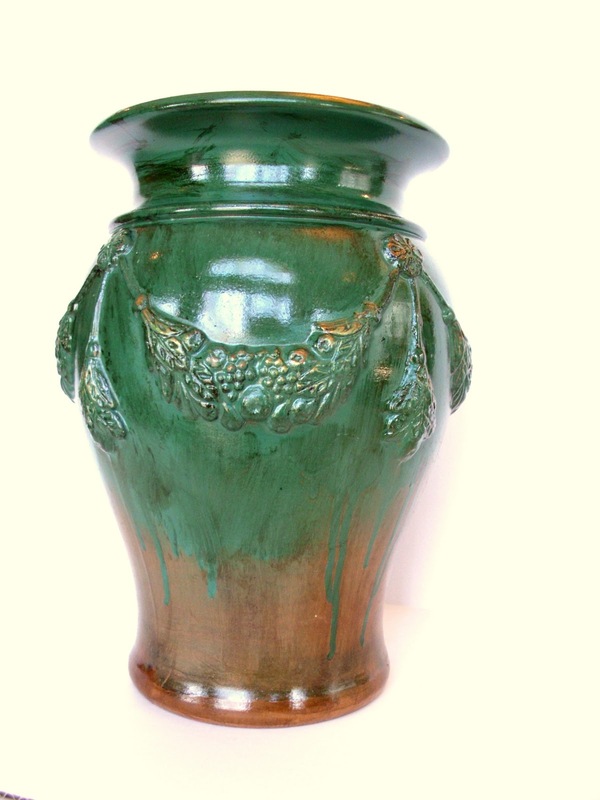 Most Anduze pots are solid colors of blue, green or mustard. When we were in France I fell in love with the ones that were terracotta on the bottom and painted with drips on the top half. These are painted similar to Confit pots. Here is one of my fifty cent pots ready for transformation. Plain terracotta with gold on the garland. See the swag of garland? It was a nice pot to start with and was stamped in the clay “France” and another word that appears to say “Stuio”. Last summer Marty at A Stroll Thru Life showed how she transformed her Chinese stool with spray paint and stain. I loved this look and decided to try it on my faux Anduze pot. Here I am experimenting with using white board with my photographs. I applied two coats of spray paint and sprayed heavier on certain areas to get the drips. Once the spray paint was dry I added Provincial stain to the entire pot wiping off certain areas for a lighter look. When dry I sanded some of the raised areas lightly for a distressed look. The final step was spraying the pot with Krylon Glaze finish. A very simple process and I love the finished pot. Check back here on January 30 for my giveaway and many more at One World One Heart. Sherry, your finish pot looks amazing. Really….it looks like its been fired with a glaze that just dripped down the sides. Perfection! Another great look and terrific idea! Keep them coming!! Plus, I will go over and look at Marty's project. Wow, Miss Sherry, you are turning out some extraordinary transformations. I love it and it does look like the real thing. I love that green, Sherry! White board, you say? I'll have to give that a try. I think my past several posts using my new camera are so much better, but I'm always looking for tips. Sherry, you are really doing some impressive finishes lately. Thanks for sharing how you did it. Love this look. 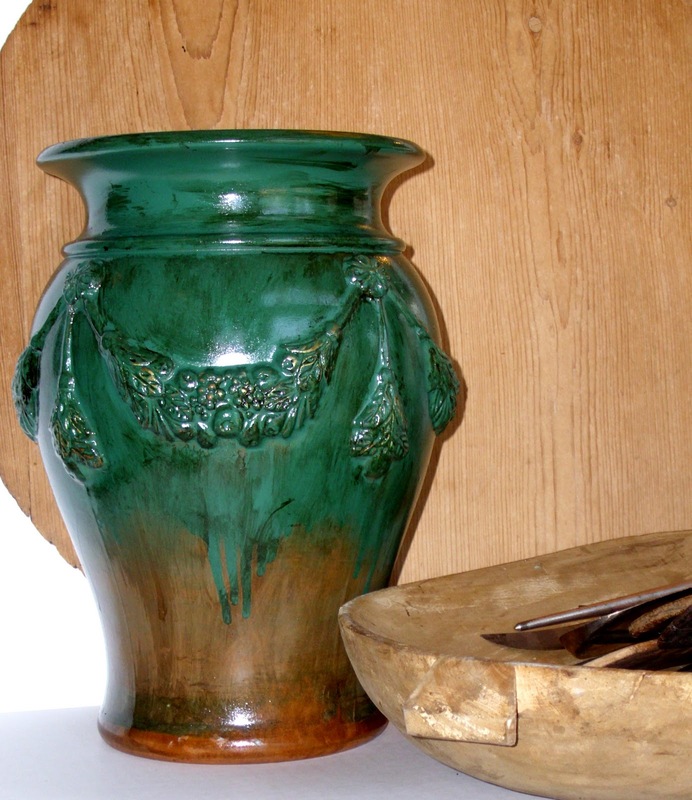 Ohhh my…I love how you refinished the Anduze pot…it turned out fabulous! I remember when Marty did the tutorial for this process and thought then that it was so pretty! Love your two color combinations as well! BRAVO, sweet friend…you did GOOD! Well dear friend, I have been doing a little catching up over here at your place. I just wanted to congratulate you on your recent win of the Whisperwood Cottage contest! Of course, I am not in the least bit surprised! I love your big plastered candleholders…they turned out fabulous! I still would like to try your technique on something! Anyway, I'm sooo happy for you, Sherry! Girlfriend, I wished that I could be of some help to you…I seen your question about a nice, warm white paint. Eeeks…I would be treading in unfamiliar territory on that one! Hehe! But I do wish you the very best in finding that perfect color! It really does look authentic! Great job! Would you mind stopping by my blog to give me some advice on a pier mirror I just purchased? I would REALLY appreciate your input! Lovely dressed out in green. I find all my terra cotta pots at garage sales too. Why pay more? That is just gorgeous Sherry! You made it look like a million bucks. Great job! I'm reading all the other comments and I am in total agreement with them! The pot looks gorgeous and you did a wonderful job. Congratulations on another crazy gorgeous transformation!! WOW! Just gorgeous! Will you come to my house and make some for me;)?! Hi Sherry! Oh, you did so good and your pot is gorgeous! That turned out so great. You were SO fortunate to get those pots. Oh your pot turned out beautifully! Beautiful!! Who would know any it's not the real deal. Wow! That is really beautiful..great transformation on that pot! Visiting from Coastal Charm. Love your blog! First let me see if I got this right?…You paid 50 cents for that pot?! Sherry, I love this transformation! The pot looks amazing. Thanks for sharing and for the inspiration. Sherry, thanks so much for sharing this beauty at the party this week. Stunning finish! Thanks for sharing, very inspiring for some stuff I've got around here! Wow, that looks amazing! I can't believe you got those pots for that cheap—what a find! Your pot looks amazing. I would never have believed it didn't come that way! Great project. What a gorgeous finish. Thanks for sharing how you achieved the look! I LOVE what you have done with your pots! I have some cement pots in the exact style of the French Anduze pots..you have inspired me to try it for sure. thank you for your visit to my blog and nice comment. Great transformation on the pot! Can't wait for the giveaway! What a fabulous transformation…..love it!